Since I've just finished a fairly big two-part series on decals and making/adding them to your models, I thought I might review the things I learned in doing this experiment for folks who are looking to get into decals on their own models. First things first, decals should not scare anyone away with the amount of work involved or because you "don't know how to apply them the right way." Given my limited experience with decals, I'm going to continue to use the MicroSet and MicroSol method for applying my decals. It's not a ton of work and it gets them on there so they really hug the surface of the model. 1. Give the MicroSet a few minutes to work on the decal before you wipe any excess away. It too will help soften the decal so it conforms to the surface of the model better. I waited 3 minutes before wiping the excess off and found the decal considerably softer. And that was before I applied any MicroSol to soften it further. 2. Patience is key. Like anything else, you shouldn't be in a rush to do this. You could do decals on an entire squad of Marines in one batch so that by the time you get done with the last one, the first one is dry enough to go back and keep working on. 3. Prep your surface before applying the decal. It might not seem like much, but I think it helps to give the surface a quick coat of varnish (gloss or flat) in order to smooth out the surface slightly. UPDATE: It was mentioned in the comments that you really should you gloss in order to get a smooth surface to place your decal on. That was echoed by another comment and I think it's worth mentioning in the post now as probably the best thing to do. Use a thin gloss coat over the area you will be placing your decal. 4. MicroSol will work if you give it time. This goes in line with not rushing to get it all done. If it doesn't work in the first pass, let it dry completely and repeat. This should do it. Once I started waiting, I found I only needed one pass with the MicroSol. And you can always use your paintbrush and apply a little downward pressure to the decal to help it conform to the surface underneath. 5. Protect your decal once it's on your model. A quick pass with a bottle varnish should help it stay in place and keep it protected. You don't want to ruin your work at this point. You can see after reading those few things, it's nothing difficult really. A few passes with a series of varnishes or chemicals and the patience to wait and let each one do its job. Decals shouldn't scare you. I'm a big fan of making mine. Particularly since the Novamarines are not supported with official decals just yet. I went the inkjet decal paper route since that's the kind of printer I have at home as well. 6. Inkjet decals require the ink to be sealed in place. I had absolutely no trouble with this step although I have read some folks have had some problems with ink bleeding. I waited and let everything dry for at least a day before moving onto the next step when I was making my decals. I went with the Testors paper and sealer products. 7.Laser decal paper requires no additional sealing of the inks, but may introduce a second generation copy if you have to print it (your decal page) on your home computer and then take that to a printing store to make a copy. You'll want to have the best copy you can get if you go this route. If I add everything up, I think I'm out around $20 for everything to do this. That includes the MicroSet, MicroSol and the decal paper. I already had the bottle varnish to use. Even adding that, I'm not over $20. Now I have the ability to make exactly what I need for my Novamarine force now. Both in terms of size and shape. And I've got the process down for getting them on the model correctly. I'm going to call this one a big win for me. I started out applying decals using just water and living with the few wrinkles I did end up with that couldn't be removed with relief cuts. Now, they look painted on and they've got much more detail than I could paint freehand. Is it going to replace freehand? No, that's still something I will use on models when it's the better method. Most of my one-off models will still see freehand since I don't want to use entire sheets of decal paper for one or two decals. As far as an army though, decals are going to take up a big portion of what was freehand work before. They aren't any great time savers for me, but their detail and consistency is what I like most of all. One thing I would add is - don't be afraid to weather decals. Once the decal has dried fully, but before you apply a layer of varnish to protect it, you can scratch away at it with a file or sandpaper. Very gently, of course! You also must apply a layer of gloss varnish beneath the decal before you do this, otherwise you will almost certainly rub away some of the paint under the decal, too. Weathering a decal like this really helps tie it into your model, especially if you have weathering on your model. Consider looking into Solvaset ... It is another decal solvent/softener highly regarded in the AFV and AC modeling circles. It is a one step application vs a two step, and I have had great success with it. When undercoating your decal do not use flat coat. It sort of defeats the purpose of the undercoat which is to create a smooth surface to apply your decal to (which then lessens the chance of trapping air which creates that "silvery" look of the clear carrier of the decal). A flat coat is flat because it is NOT a smooth surface. That non-smooth surface diffuses light and creates the flat look that so many of use like on our minis. That same flat surface will trap air like nobody's business and make your decals look like crap. Wow, this was really a timely article for me. I've been hemming and hawing about how (or if) I could do decals the Space Wolves I'm starting. This was incredibly helpful, thank you! I have to agree with Jay, above. Using a gloss coat under the decal gives me much better results with no silvering. I guess flat works for you, but I'd still stick to gloss. Thanks for the comprehensive information. Armed with this I will have very little reason to avoid making my own transfers for my Tallarn vehicles!!! Anyone else having crazy thoughts of crazy things they'd do with decals? admin: Thanks for the link! It always helps to see other ways to do things. Sholto: Yes indeed, weathering your decals to the same level as your model should help tie them in perfectly. And the tip about the gloss coat under the decal you do is a good one too. Adam Catt: Thanks, I may see if I can get my hands on in the future. Until I do though, the MicroSet/Sol makes a great step up from just using water. Jay Adan: Interesting. I didn't have any troubles with air under my decal, but that's worth thinking about. Since I'm applying a flat coat over the finished decal, I may use gloss in the beginning just to be safe. And thanks for the link! Ashley: Do it, it's super easy once you get the feel for it. And the look is night and day in terms of quality. The Inner Geek: Gloss it is for me know. Even though i had no issues this time, I'd hate for something to crop up later on. Klumsee, the goblin. : Now that's interesting. It might take a bit more work, but I suspect it could be done. I want to try adding the fine digital circuit board look to Necron vehicles using decals. I think it might give them a bit more detail instead of trying to freehand it place. 1st: Since you want to avoid dust setting on your decal while MicroSol does its magic you might want to use some sort of cover or place your mini in a box or such. Absolutely don't! I´ve done this once and ended with crackled decals which I had to remove and start anew. Just let MicroSol vent and all be fine. 2nd: To help the decal set properly with MicroSol try to position your mini so that the decal faces straight upwards. 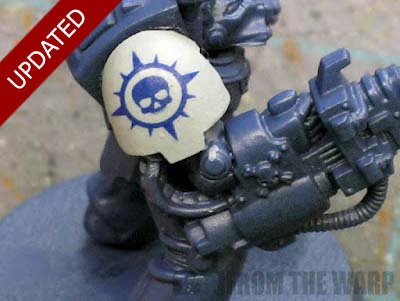 For example turn Space Marine about 90° when applying decals to the shoulder pads. And of course under no circustances touch the decal until MS hat set. Anon: Excellent stuff, thanks for the tips! Can't remember which article it was that mentioned clipping between parts of a decal to allow smoother adhesion, but whover mentioned it, thanks. 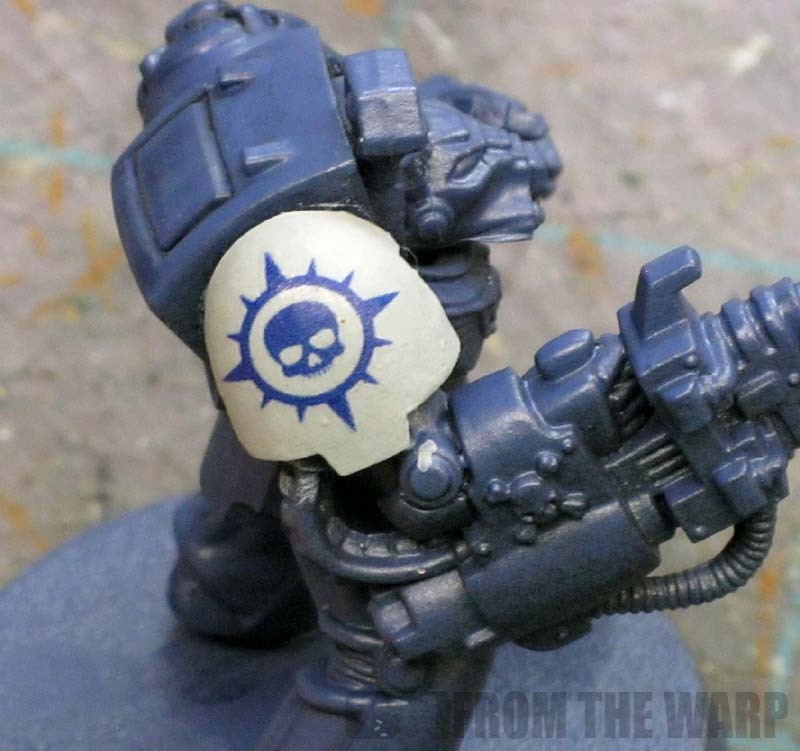 It made putting assault marine decals on shoulder pads (for Flesh Tearers marines without jumppacks) MUCH easier. Da Warboss: Excellent, glad it helped get your decals in place. Little tricks like that make the process so much smoother.